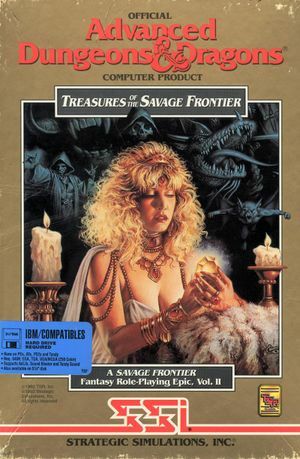 Saves and characters can be imported from Gateway to the Savage Frontier. Pools of Darkness characters are also compatible. Bundled with Pool of Radiance, Hillsfar, Curse of the Azure Bonds, Secret of the Silver Blades, Pools of Darkness, Gateway to the Savage Frontier, and Forgotten Realms: Unlimited Adventures. The default save folder can be changed by editing TREASURE.CFG. Saves are SAVGAMA.PTY to SAVGAMJ.PTY. Character files are *.PC. Character files are only present when that character is not part of a party in a save file.